Comparing ultrabook vs laptop is not our main intention here, but to point out noticeable differences so that you can be aware of what to buy the next time you think of purchasing either of these. Laptops come in different sizes and forms. Also, there are different sub-categories within the laptop category. Out of these, ultrabook vs laptop seems to be the most prominent one. In the past few years, the number and popularity of ultrabooks showcased impressive growth. Some manufacturers even started coming up with budget-friendly ultrabooks. Therefore, people get confused between what is the difference between an ultrabook and a laptop or what is an ultrabook good for when they need a laptop. If you are in such a confusion, don’t worry. 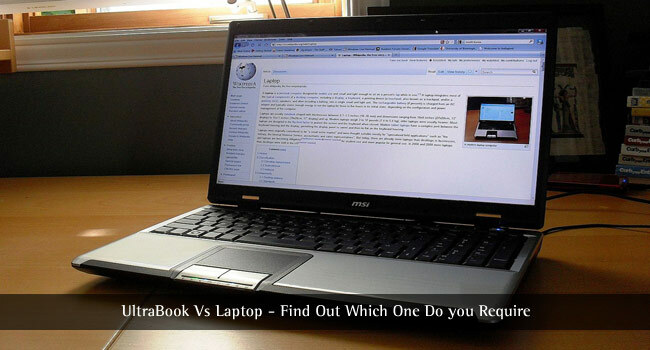 In this article, we will help you with that, by comparing ultrabooks vs laptops in an extensive manner. We will also dig down deep to explain why are ultrabooks so expensive. So, in the end, you would know which type of portable computer you require and what things you need to know before buying a laptop or ultrabook. Ultrabook vs Laptop – What these Devices are? The laptop is one of the portable personal computing devices that have been in use for decades. As you know, these devices have an integrated display, keyboard, trackpad and other accessories brought into a single structure. When the lid closed, the device is in rectangular structure and it can easily be carried around. The size of a laptop depends on the screen size. In the majority of cases, laptops have a screen size of 13″ to 20″. Once again, this is subject to the type of configuration. Typical laptops stick onto the screen size of 15.6″. Laptops can have a weight between 1KG to 8KG. Ultrabooks are also some ultraportable personal computing devices. Or, in simpler words, we can call ultrabooks a newer breed of laptops. There is a no bigger difference in terms of intended use or behavior. However, you can distinguish between a laptop and ultrabook based on the design, style and portability aspect. If you are still wondering what is an ultrabook, it is a set of specifications, decided by Intel Corporation. These are supposed to be high-end subnotebooks that do not feel bulky or compromise battery life. Intel Corporation maintains a number of specifications for a laptop to be called an ultrabook. We will discuss these specifications later. So, these are the major definitions used for laptops and ultrabooks in common. Now, we will move onto the comparison. Before that, there are some similarities between ultrabooks and laptops you should know. 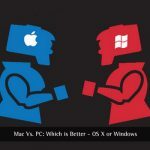 Ultrabook vs Laptop – What’s Common? Here, we can list out the basic commonalities between ultrabooks and laptops. Laptops and ultrabooks can be carried around easily, even while traveling. Both can be used via battery power; though plugged-in use is also supported. Ultrabooks and laptops come with the same Operating System and Software; Microsoft Windows, for example. Connectivity options are almost same; USB Ports, Ethernet Ports etc. We hope you have an idea about the common things. Now, we will consider each section to find out differences. Ultrabooks are much thinner when compared to traditional laptops. According to the standard set by Intel, an ultrabook of 13.3″ display should have a thickness of less than 20mm. If the ultrabook has a touchscreen, the thickness can be up to 23mm. Ultrabooks are available between 11″ to 15.6″. Most ultrabooks weigh less than 1.5 KGs, handy laptops. You can find ultrabooks that weigh less than 1KG. In most devices, you can find Magnesium, Carbon Fibre, Glass etc being used. Weight and screen size depend on the intended purposes. Traditional laptops come with a variety of choice for screen size and weight. You will be able to find laptops in varying screen sizes, from 13″ to 20″. There are no specific standards, the weight of these devices can be anything. You can find the same configuration devices for 2KG and 3KG. For gaming-oriented laptops, the weight can go up to 6KG or 8KG. Unlike the ultrabook series, there are no particular standards for thickness. Depending on the device configuration, the thickness will be between 20mm to 40mm. Ultrabooks offer enhanced battery life as compared to Laptops. Intel Corp. has set some regulations in this aspect as well. An ultrabook equipped with Intel Haswell chipset should have a Windows idle time of 9 Hours and HD Video Playback time of 6 Hours. It means you can get an impressive battery life with moderate usage patterns. In ultrabooks, batteries are placed with extra care – as to save space. Non-removable batteries are used and tightly enclosed with the whole hardware. Traditional laptops give equal emphasis on performance and resource availability. Due to this, you cannot expect a huge battery life from a typical laptop computer. Some manufacturers offer better battery life but the average is somewhere around 4-5 hours, at maximum. You cannot even think about whole-day use, and it becomes necessary to get your charger in your baggage. However, unlike ultrabook, batteries and other hardware components are easily removable and accessible. So, replacing your laptop battery won’t be an issue. Ultrabooks use SSD Storage or a combination of HDD+SSD. There are different reasons for Solid State Drives. First, SSD is offering better boot-up time. Most ultrabooks can be switched on in a few seconds or so. Second, SSDs are much durable than common HDD storage. That having said, you cannot expect 1TB or 500GB SSD storage on ultrabooks. In most cases, they are brought down to 256GB or even 128GB. But, given the availability of removable storage options, you can easily use a portable HDD or Pen Drives. In most of the traditional laptops, HDD Storage is still used. It’s so because laptops are supposed to have an impressive option for storage and all. However, there are a few laptops that ship with SSD Storage, meant for enhanced performance. Yet another mandatory characteristic of an ultrabook is the use of Intel ULV Processors (Ultra Low Voltage). These processors are deliberately underclocked, to reduce power consumption and stability. This happens to be the reason why ultrabooks have better battery life. After all, these ultraportable notebooks are meant for smaller uses, and not to be used as portable workstations. That having said, in the past year, we have seen ultrabooks that ship with quad-core processors and another high-end spec. HP Spectre series is something you’d love to check out. Talking about graphics, most ultrabooks have integrated graphics options. But, if you get to those expensive choices, you may get to have dedicated graphics properties too. It needs to be noted that manufacturers put an efficient amount of RAM in these devices – 4GB or 8GB. Combining all these resources, ultrabooks can offer a balanced output of efficiency, battery life and speed. Performance isn’t a stable factor for traditional laptops. Most laptops don’t use ULVs or SSD Storage. Because of these, you cannot expect such a speed or boot-up time in common laptops. Ultrabooks are much expensive than traditional laptops. You can get a traditional laptop for even around $300 or $400, the best affordable laptop range, we call them – we mean, the devices with basic configuration and features. However, you have to spend around $1000 if you like to get an effective ultrabook from a trusted manufacturer. Some manufacturers are coming up with an affordable ultrabook solution. ASUS is an example of this. 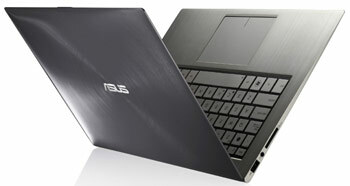 By spending around $100 more than a basic laptop, you can get a good-to-go ultrabook from ASUS. But, if you are looking for one of the best ultrabooks, you need to spend more than $1000. Ultrabooks use smaller-size keyboards in comparison. Also, you can see backlit keyboards on most devices. Some ultrabooks give extra space for the trackpad, to be used with gestures. Ultrabooks ship with Windows 10, and not macOS, Ubuntu or Linux. So, we have compared the differences in ultrabook vs laptop duo. In the end, ultrabooks are much more comfortable and user-friendly than common laptops. Of course, there is the difference in terms of performance and intended purposes. For instance, you cannot use an ultrabook as a portable workstation. Also, in comparison, the best ultrabooks will take a lot of money from your wallets. Despite all these, if you can bear the price and need features of portability, ultrabooks are better than traditional laptops.